This was a brilliant autobiography about an amazing and resilient woman. I’ve heard Assata Shakur’s name several times over the years but I knew next to nothing about her. It was only when earlier on this year her name resurfaced when she became the only woman on the FBI’s most wanted list that I decided to read the book to learn what all the brouhaha was about. This is one of the most riveting books I have ever read. I experienced so many emotions when reading this book. For the first part of the book, the main emotion was disgust and shock, firstly at the police brutality Assata experienced (it was very hard to read some of the graphic scenes) , and also at the American judicial system which was clearly racist. 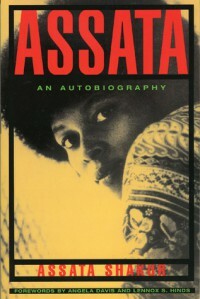 The book tells two stories concurrently; the chapters about Assata’s court case for supposedly murdering a state trooper and subsequent escape from prison were nicely interspersed with her story of her growing up until she became a member of the Black Panthers and the Black Liberation Army. Her writing has her genuine and authentic voice and her story is enthralling. She has such a brilliant sense of humour. The whole book was very readable and informative. “I keep staring at him. Nobody could look that corny. He’s like a ghost from the past. I’m convinced he doesn’t know it’s 1973.” (Assata talking about the prosecutor at her trial). One thing that impressed me about Assata were her great points of observation about poor education, slavery and racism, and the evils of capitalism. She is a great advocate for African/African-American culture and spends some time talking about how Eurocentrism is one of the main reasons why black music, art and literature is unfortunately often considered “primitive.” She believes that what’s important in life is having personal dignity and she exhorts people of the African diaspora to be proud of their heritage. The book made me question why the world is seemingly pushing for homogeneity when cultural diversity is a lot more interesting. I was curious about some things, for example Assata’s insistence of spelling America and court with k’s instead of c’s, and her haphazard capitalizing, or lack thereof of the letter “I.” Was she trying to rebel? I’m not sure. I also wish she had included how she had escaped from prison. I guess the reasons why she didn’t are obvious but a quick google search told me how it was achieved so it’s not exactly top-secret. I feel regardless of whether one feels Assata was guilty or innocent (personally, I don’t understand why she was put on the FBI list after 40 years), everyone should read this book. Yes, race is a huge part of it but capitalism is also talked about a lot and I think her insights into the system are very useful and enlightening. out wailing to the rain.